CONTACT US AT 800-790-2763 to order, as it is in stock! 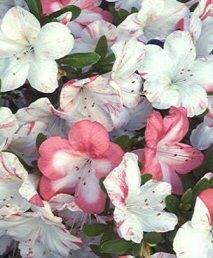 Native to the mountains of Japan, satsuki azalea is a cultivar group of azalea cultivated by the Japanese. "Satsuki" in Japanese is in reference to the blooming period, the fifth month of the Asian lunar calendar. They have a diverse range of flowering color patterns with often multiple patterns appearing on a single tree. Our tree shows off its beautiful pink and white flowers from May to June. The circumference of the trunk measures 16". The diameter of the trunk measures 5". This specie is often used by many Bonsai enthusiast and is a common subject in Bonsai shows. Beautiful show piece that will be sure to catch any eye on a patio, deck, or balcony. Keep outdoors. CONTACT US AT 800-790-2763 to order, as it is in stock! 58 years old, measures 21" x 16" x 24" tall. CONTACT US AT 800-790-2763 to order. 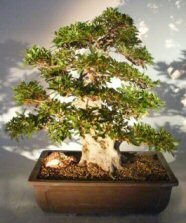 Flowering outdoor evergreen bonsai tree, grown and trained by Bonsai Boy. Potted in a 16" brown rectangle mica container. Suitable humidity/drip tray is recommended. To purchase add $21.95. Circumference of trunk measures 16". Diameter of trunk measures 5". CONTACT US AT 800-790-2763 to order.